Large broad leaves kind of scalloped on the edges. One has pretty red flowers the other yellow. I am woefully ignorant about ALL plants. I hope you can help me identify and keep these beauties alive through the very cold White Mountain winter. First of all, these will only survive the winter as indoor house plants. 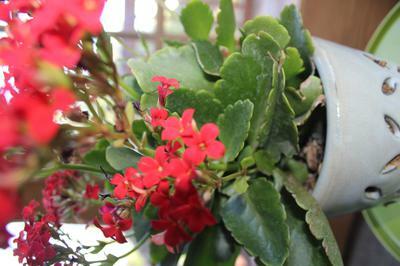 They're Kalanchoe blossfeldiana, or Flaming Katy, which are a tender succulent plant and only live where there is no frost (outdoors). So grow these in a bright window, or preferably, under a grow light so they get twelve hours (at least) of light. This mimics the day length where they originate, close to the equator. They may not flower the whole time, as this is something that is timed to perfection in the greenhouses that specialize in providing flowering plants to grocery stores and garden centers. 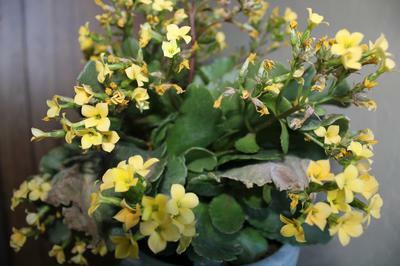 It's hard to 're-flower' them, as it's dependent on length of daylight (or other light) and temperature, as well as the watering schedule, and fertilizer application. These things are all carefully timed to get them to bloom. However, you can certainly grow them indoors for the winter, and on a bright patio or deck for the summer. Sometimes this is enough to get them to bloom again. 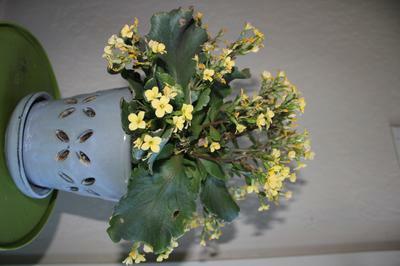 See more about Kalanchoe blossfeldiana here.